Cliff Hillhouse, my HD engineer and I, back in the late 80's and the '90's worked for the Public Television station in Seattle, KCTS-TV. KCTS was a pioneer in High Definition back when it was thought to be too expensive, too cumbersome, and just too impractical for a local PBS station to acquire. The Japanese had invented it and around that time there was fear that the Japanese were taking over the economy of the US. KCTS had a relationship with NHK, the Japanese public broadcaster, because we had teamed up in 1989 to shoot the first high definition aerials in North America thanks to our CEO at the time, Burnie Clark. We had completed three very successful standard def "Overs" so we had developed an expertise with this type of filming. 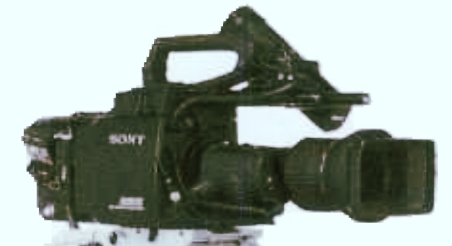 KCTS bought the first 1" ccd HD camera from Sony, the HDC-500 and a Sony UniHI vtr along with some camera control units and monitors. The camera body itself was a half a million dollars. It was a bold move to say the least. Many were critical that a Public Television station would spend so much money on such new technology. We had a proven commodity in the "Over" series. They would bring in pledges. Also the purchase and commitment to HDTV would put the station on the global stage. And it did. Almost immediately we began filming "Over America" in stunning high definition. Unfortunately there were not very many outlets to view it in the way it was captured. But we all know what eventually happened with HD. The camera itself was amazing! The 1 inch CCD's were incredible for that time period. It was heavy, that's for sure, and only cine style lenses would fit it's mount. The camera was attached by a thick cable to the UniHi VTR deck which was invented to make shooting more portable, Before the UniHi we were using a one inch digital reel to reel deck that was normally just kept in the studio and weighed almost a 100 lbs. Very difficult to move around much with that deck. We flew hundreds of hours around the country, from sea to shining sea including Hawaii and Alaska using this configuration. When we began shooting aerials in the late eighties we used Tyler camera mounts, the Middle mount, the Major mount and the Nose mount. I believe ultimately I shot over 2000 hours using these trusty mounts. 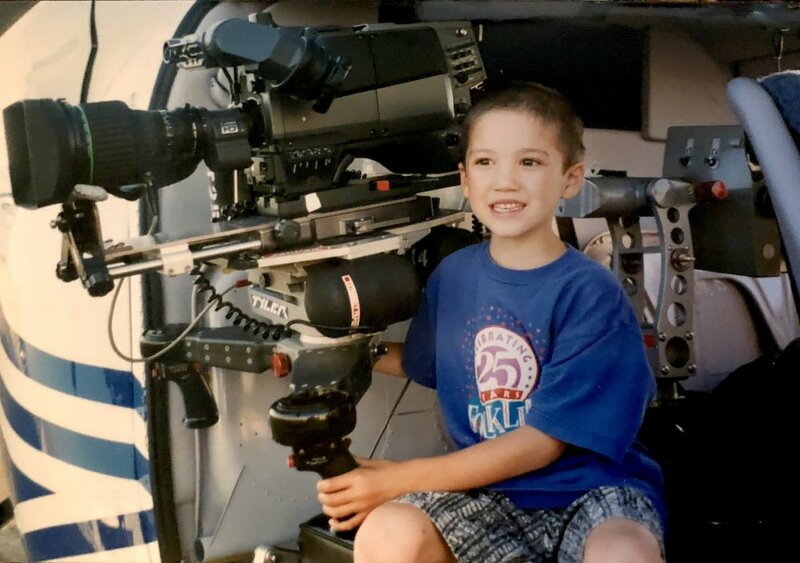 My son Taizo with the Tyler Major Mount before drones. He and I are a lot older these days. The Tyler Middle mount, looks like a winter shoot, love the glasses. By the time we were contracted to shoot in southwestern Pennsylvania by Bob Oltmann's of Skutski-Oltmann"s for a presentation at the Western Pennsylvania Environmental Awards we were very confident in what we could do. But when you add the helicopter to the mix, you just have to pray that the machine works and the pilot knows what he or she is doing. 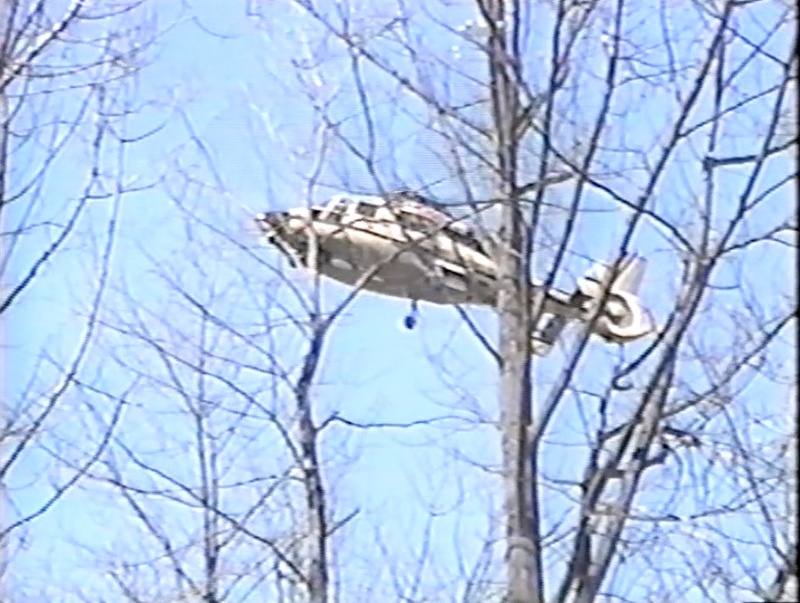 In all my years of flying I was lucky to get some of the best chopper pilots at the time. Most were Vietnam vets who had been through the worst of it and knew how to bring you home. After the accident, the camera and lens were a complete loss. With the insurance settlements KCTS was able to replace the HDC-500 with the brand new HDC - 750 studio camera and the brand new HVS-700 HD camcorder which would revolutionize Hi Def capture. I've got a good story on that one too, coming up one of these days. But now the story of the "Crash" continues... in the next blog. In the meantime check out some of the video of what we did manage to salvage before the crash. Gosh, Joe was a great pilot!!! !